Tingle me Pink is a unique Pale Ale with Hibiscus, Rose Hips, and Szechuan Pepper. Fermented with a wild yeast from Southern California. Slightly pink, fruity/tart, finishing with a tingle on the lips and tongue. It's also a beer with a cause. 8% of my profits from sales of Tingle me Pink, for as long as it is brewed and enjoyed, will be donated to organizations advocating awareness and research for the cure of Breast Cancer. The first batch is really a pilot batch to test the results of a rather unique idea. The concept was to make a beer with a pinkish hue because pink is the color used most often for all things advocating awareness and research for the cure of Breast Cancer. Then it needed to be attention getting in some way, without being gimmicky. So there's two unique things going on with this beer. First, it's fermented with a wild So Cal Saccharomyces yeast that imparts clean, fruity, dry, and vinous characters to the beer. Second, it has Szechuan Pepper as a spice component - unusual for the tingly numbness it leaves on the tongue and lips. 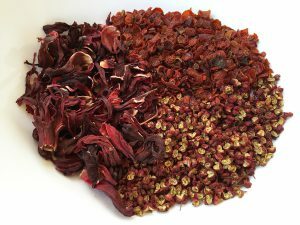 Hibiscus, Rose Hips, and Szechuan Pepper. The herbs in Tingle me Pink. So what's still developing? Well, if people love the beer, I will very likely be collaboration brewing it at a brewhouse with impressive capacity, that will also donate a significant amount of profits to the same class of causes. I'm hoping to collaborate with other breweries, as many that are interested, to brew as much as possible. Because it is not only an amazing good beer, but every pint brewed will benefit a great cause. 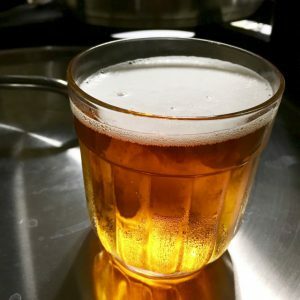 So you've got an unforgettable beer, from which a portion of the profits will be donated to great cause for as long as it is brewed and enjoyed. Got to be honest, that's a pretty cool concept. Cheers - to good health!